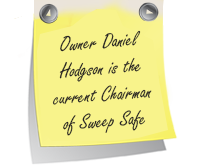 At Clean sweep we strive to give the customer the best possible service and in doing so the professional field that we cover has been extended to offer a pressure or integrity test. 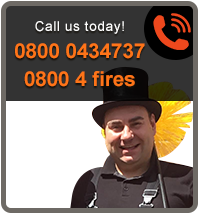 Using state of the art equipment we are able to ascertain the integrity of the flue and give a definitive answer as to whether or not the chimney needs relining. The equipment used for this test is the DP23 unit which is manufactured by Wohler in Germany. Until recently the only other method that is accepted for this test is a sealed smoke test, which relies to the best part on the experience of the person carrying out the test. This means that 5 different people can carry out the test with 5 different results. With the machine this cannot happen. 1. 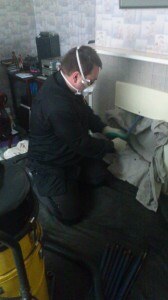 Firstly the chimney is swept and a basic smoke draw test is performed. 2. The length of the flue is measured (usually from the roof) and the chimney top is sealed off. 3. Sealing elements are then inserted into the flue just above the fireplace opening along with a sensor probe and compressor hose. 4. The test equipment is then attached to the probe and compressor hose and the test then commences. 5. Upon completion of the test the user inputs the flue dimensions and height and the machine works out the allowable leakage rate, and a pass or fail icon is displayed. 6. Finally a printout is printed which is signed by the user and presented to the customer. 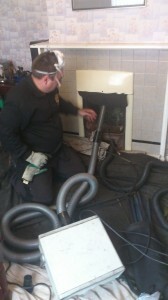 The primary reason is to ensure that the chimney is not leaking poisonous fumes into other areas of the residence. Secondary reasons include the fact that relining a chimney may be costly and not always necessary. Also the chimneys up draught may be badly affected by a leaking flue; it will become less efficient causing back smoking problems or creosote to accumulate on its linings which can lead to a chimney fire. Q. Why do we use a machine and not smoke? A. Testing chimneys integrity with smoke is biased and does not give consistent result. 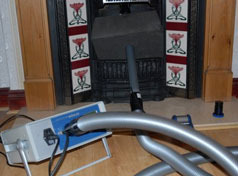 The type 1 smoke test involves sealing a certain volume of smoke in the chimney compartment, waiting and looking for escapes and finally JUDGING that same amount of smoke exits the pot as was generated by the smoke pellets. This test is contentious at best and five people undertaking this test will likely give five different results. The smoke type 1 test is no longer allowed in most European countries and has been replaced by the accurate BS EN 1443 test that clean sweep utilise.